In the previous post, I add the C to EBT. This resulted from over a decade of research, application in many countries and cultural contexts, and much metacognitive activity (e.g., painful thinking about stuff including my own thinking) to demystify creativity in the context of teaching and put to bed my personal nemesis of understanding what makes the ‘naturals’ in teaching. Yes, Peter Drucker—I think I now know, at least in good part. 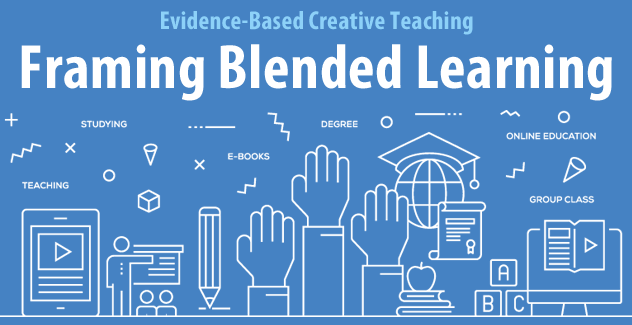 This fourth post applies Evidence Based Creative Teaching (EBCT) to the design and facilitation of blended learning. This should be easy to follow and make good sense, provided you have fully digested the previous posts’ content—have you? Equally, new terminology such as the Flipped Classroom (e.g., Bergmann & Sams, 2012) have added another frame to complicate the educational mix even further. From my perspective the Flipped Classroom is no more than a blended learning format in which online work on key underpinning knowledge is completed before more application orientated work is facilitated in the face-to-face context. How effective is Blended Learning? Hence, no matter how much information we have in terms of gigabytes and terabytes, it is not going to get quickly assimilated and nicely integrated into long-term memory. The same Core Principles of Learning apply irrespective of mode or medium. Looking into a computer screen does not change how our memory systems work. Technology does not make learning more engaging or meaningful. A great lesson does this…technology can make it more effective and efficient. For many years I sat, and frowned, in meetings on the use of technology tools. I listened to enthusiasts who showed that with several clicks on fuzzily conceived icons one could read other people’s opinions as well as offer one’s own opinion on an online discussion board. It seemed to them that this technology affordance would exceed the frustration and inconvenience of its complex technical use. It did not for most of us. The pain exceeded the relatively small pleasure, and it was far from novel. From an EBCT perspective, we can now analyse and evaluate the use of various technology platforms and tools in terms of how they can enhance specific aspects of the learning process. In this way we can select and creatively combine those e-tools which are most effective and efficient in promoting learning, and not use technology simply because we have it. The completed blended learning design maximizes the affordances of a range of learning modes, mediums and methods to enhance learning effectiveness and efficiency (e.g., attainment levels, interest/engagement, differentiation, access and flexibility). E-tool combinations that enhance a number of cognitive principles of learning simultaneously will likely have a synergistic impact in terms of enhancing student attainment opportunities and the experience of learning. For illustration, the SoftChalk content and E-learning creation and management software has proved invaluable for me in being able to create high impact and user-friendly online tutorials across all areas of pedagogy and cognitive science related topics. Using an EBCT design framework with SoftChalk’s ease of use and facility options enables quick creation and uploading of most content media, a range of activity options to provide engagement and feedback, and even asynchronous discussion through embedded Padlets. Similarly, The e-tool Kahoot, a free game-based learning platform, when used effectively (especially creatively), can result in a high level of student attention and engagement with the content learning, activate prior knowledge, check conceptual understanding, act as an advance organizer for new content, and create fun in the learning process. In the language of cognitive science, this can have a strong Von Restorff Effect (the tendency of the brain to activate when presented with a novel stimulus) and result in a useful motivational strategy for student learning. As with all teaching methods, the over-use of any e-tool will habituate over time and lose effectiveness in the learning stakes. You may remember my chili crab story from the second blog post! I have seen faculty get disappointed when an e-tool, which once got very positive attention, gets little more than a few glances forward. Like a good menu in a restaurant, today's teaching professionals need to have more than one tasty ‘pedagogic morsel’ of each genre to put on the table—so to speak. As the creative combination of methods, activities and resources underpins creative teaching in the face-to-face context, the same design principles equally apply in the online environment. We now have an increasing range and variety of e-tools that provide affordances for different aspects of the learning process, hence the increasing potentiality for more and more creative combinations. Furthermore, as we create and develop effective and efficient method and e-tool combinations (blends), the creative process will, over time, lead to highly synergistic embedded learning experiences that will move us towards the ideal of maximising learning opportunities and attainment for all students. If teachers of yesteryear, armed with only a blackboard and a set of coloured chalks, could still create interesting and effective lessons, (and there were those who could do this) then what’s the potential for the highly creative teacher in the present context? An equally pertinent question is how to develop more creative teachers as part of professional development? In the final blog post of this series, I offer the EBCT approach for achieving this. Abeysekera, L. & Dawson, P., (2015) ‘Motivation and cognitive load in the flipped classroom: definition, rationale and a call for research’. In Higher Education Research & Development Vol. 34 , Iss. 1. Bergmann, J. & Sams, A., (2012) Flip Your Classroom: Reach Every Student in Every Class Every Day. ISTE, London. Bersin, J., (2004) The Blended Learning Book. John Wiley, San Francisco. Hattie, J. & Yates, G. C. R., (2014) Visible Learning and the Science of How we Learn. Routledge, New York. Littlejohn, A. & Pegler, C., (2007) Preparing for Blended e-Learning. Routledge, London. Mlodinow, L., (2012) Subliminal: How Your Unconscious Mind Rules Your Behaviour. Vintage Books, New York. Moskal P, Dziuban C, and Hartman J., (2014) Blended Learning: A dangerous idea. In Picciano, A G., Dziuban, C.D. & Graham, C.R., (Eds) (2014) Blended Learning Research Perspective Volume 2. Routledge, New York. Olbrish Pagano, K., (2013) Immersive Learning: Designing for Authentic Practice. ASTD Press, Alexandria, VA.
Picciano, A G., Dziuban, C.D. & Graham, C.R., (Eds) (2014) Blended Learning Research Perspective Volume 2. Routledge, New York. Stein, J and Graham, C. R., (2014) Essentials for Blended Learning A Standards-Based Guide.. Routledge, New York. About Dennis Sale: Dennis Sale is the author of Creative Teaching: An Evidence-Based Approach (Springer, 2015), the first book to demystify creative teaching and make explicit how it works at the level of specific teaching practices, underpinned by the creative application of cognitive scientific principles. He has worked in all sectors of the British education system, spending some 3 decades training and mentoring over 3000 teaching/training professionals in many countries and cultural contexts. Presently he is Senior Education Advisor for Singapore Polytechnic, and Principal Investigator for a 2-year Ministry of Education research project, entitled ‘Enhancing Student’s Intrinsic Motivation: An Evidence-Based Approach’. Dennis is a long time SoftChalk user and has conducted workshops for educators showcasing SoftChalk as a way to improve their lessons.